Maxxamillion is feeling much better and is very close to feeling normal. We're so happy that he can go up and down the stairs without hesitation. Also, for the first time since his surgery, he did his favorite flip upside down on his back barking with joy - which he had always done at least once a day when he'd go outside. 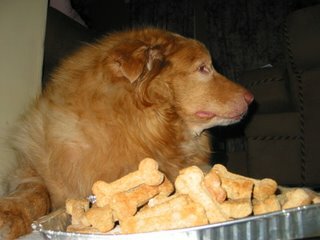 As you can see the in the picture, we made Maxx his favorite home made oatmeal dog biscuits, which he enjoys very much.